I could go on and on but what would the point be? This Giants team suffered a humiliating loss after leading 5-0 last night with MadBum cruising until the fifth when our ace and World Series hero could not get that precious shutdown inning. It would get worse from there and the grand slam by Kevin Pillar, a bullet of a homer deep in the left field bleachers, would be wasted. PIllar’s grand slam was the first by a Giant since 2018. It was the first of his career as well. 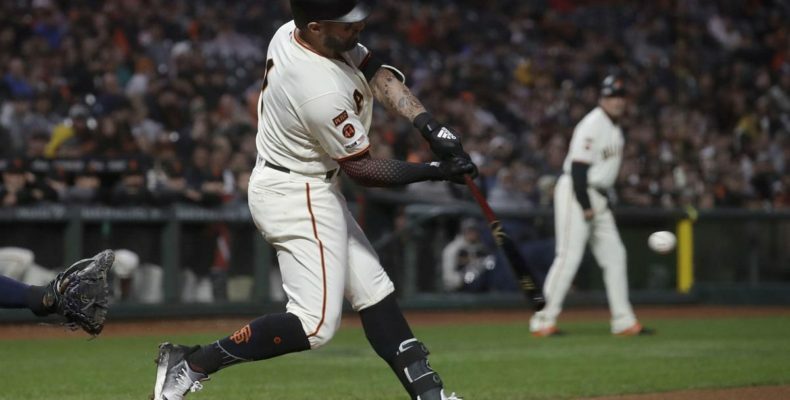 In a sign of their lack of power, the Giants were the only MLB team to go without a grand salami in 2018. 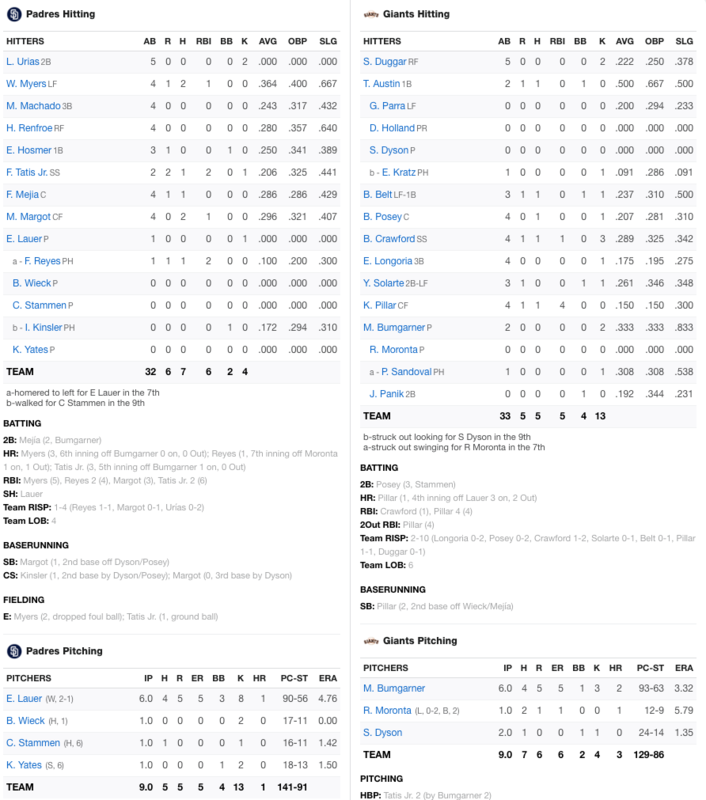 To lose after a 5-0 lead, after an inspiring grand slam and with your ace on the mound at home… well.. it hurts a lot. It’s the kind of loss that can derail a season. 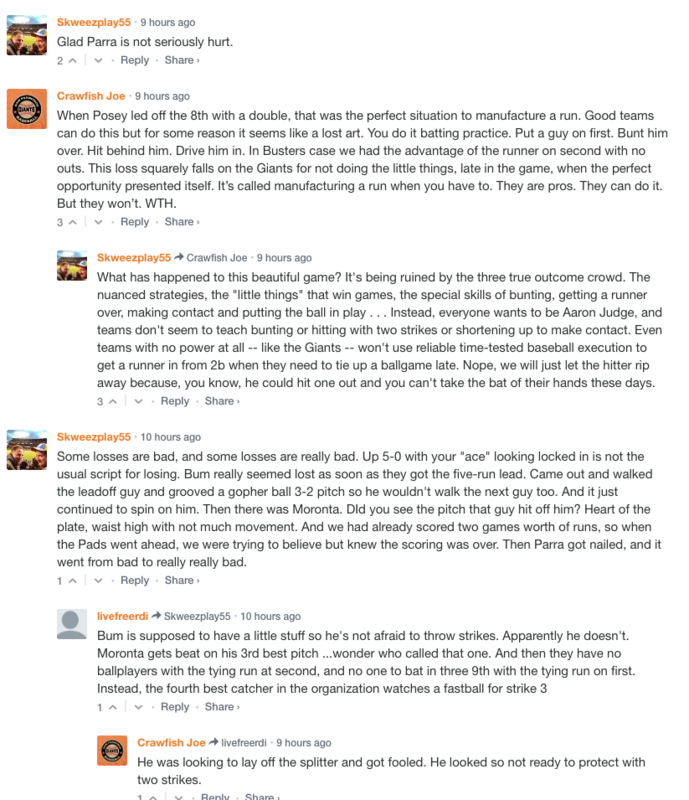 Bumgarner has moved away from his fastball either because he does not trust it or because he cannot locate it. This makes his other pitches more predictable and batters are starting to adjust. He is losing his patience and composure far too often, particularly on borderline pitches that are likely balls. He needs to be reigned in now. Bumgarner has to adjust or we will be witnessing the decline of a true Giant. This feels eerily similar to when Timmy started to get hit hard in early 2012 and became a nibbler when his fastball betrayed him..
Nobody other than BB9 is producing at the plate on a regular basis. The Giants made another acquisition yesterday, trading for Tyler Austin in exchange for Malique Ziegler. Austin was immediately inserted into the starting line up at first base yesterday. Brandon Belt started in left field, in a move that shows you how desperate the Giants are for runs. 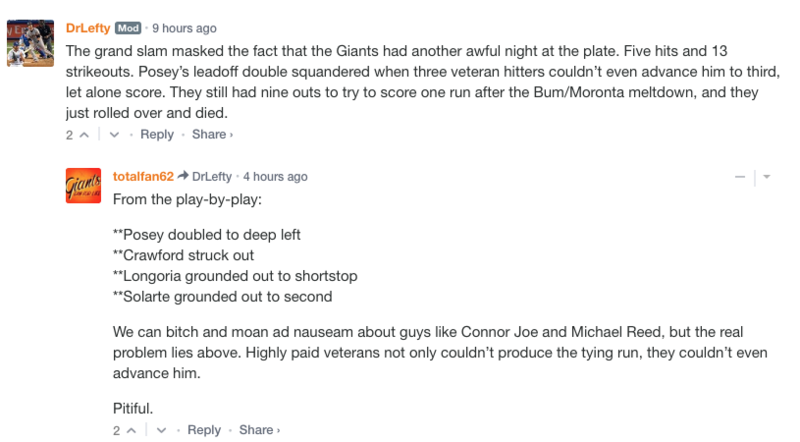 While I am non-plussed by these scrap heap acquisitions I don’t agree with the team’s decision to immediately insert these AAAA players into the Giants starting lineup and move players like Brandon Belt out of position. This whole scenario reeks of desperation and throwing things at the wall to see what will stick. One more thing: Last night’s announce attendance was 28,000 and change, the lowest since a game in May in 2010. The feel of the park on television was akin to a college or high school ballgame by the eighth inning. 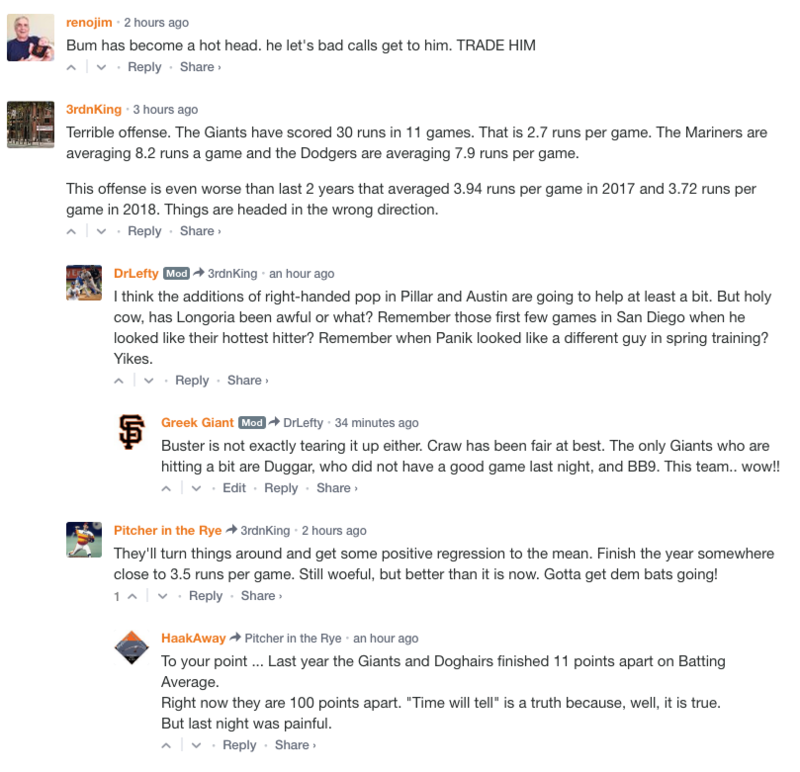 This is getting depressing and it is beginning to hurt the Giants in their wallet. Stadium Club level seats could be had for $15! To make room for Austin on the roster, Connor Joe was Designated for Assignment, which is a stupid way of saying he was cut. Gerado Parra was hit in the face by an errant fastball but appears to be ok. The ball did not hit him flush and he escaped with a cut lip. In tonight’s game Joey Lucchesi of the Padres faces off against Derek Holland. First pitch is at 6:45, Willie Mays Field time.